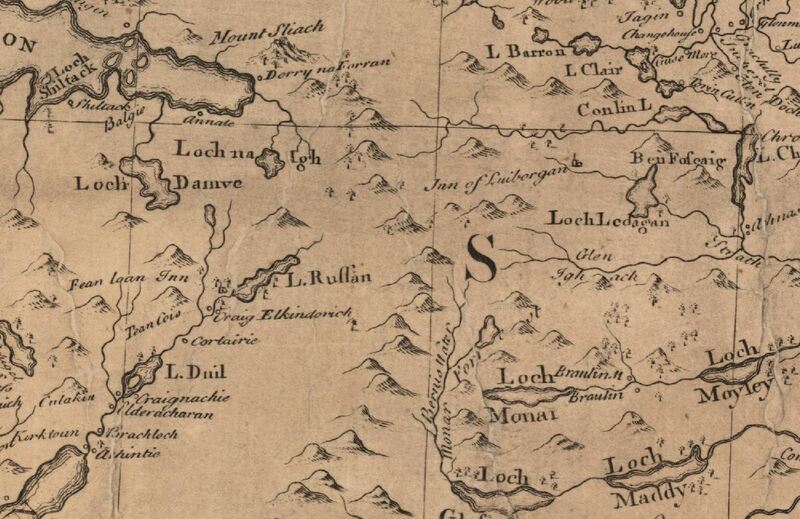 The Roy map of c1750 has just two tracks or roads in Ross-shire linking the east coast with the west coast; one track, that described above, passes through Strathconon and a further one a few kilometres to the north, passes through Strathbraan from Garve to Achnasheen. 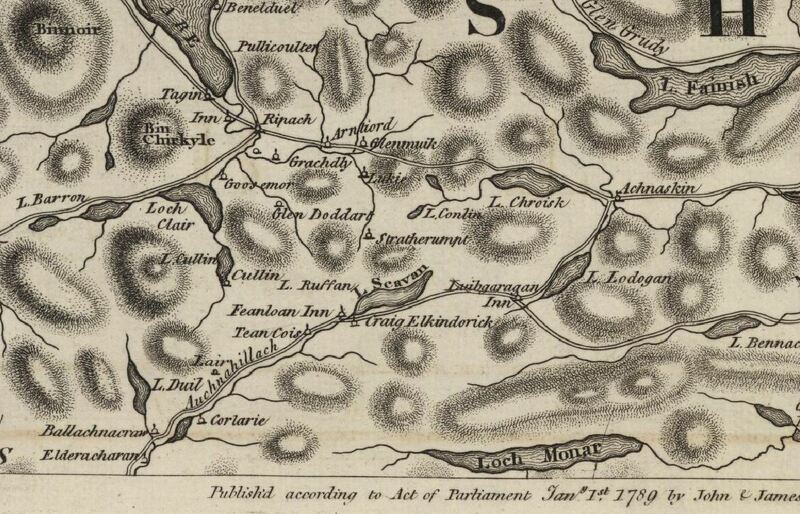 The construction of a road from Contin to Poolewe on the line of the latter first appears in the record in about 1760. Probably built by Caulfield this road seems to have been kept in some sort of repair for a short while afterwards but by the end of the 18th century it was in poor condition and Lady Seaforth on her way to Lewis could only get as far as Loch Achanalt where her coach became a complete wreck (Inverness Scientific Society Transactions, Vol 5, p382, 1899). At this time the importance of good communications were being recognized as paramount to the economy of the Highlands and in 1801 Thomas Telford was appointed to report on the state of the roads and to plan safe and convenient routes for new roads. The “Loch Carron road”, through Strathbraan, which bifurcated at Achnasheen, would serve the purpose of linking the east with Poolewe in the west, where the cattle from Lewis were landed and also Loch Carron and Strome Ferry in the south west. It must have been chosen by Telford for upgrading in preference to the Strathconon route. The new road was completed by 1817 and for travellers heading from Loch Carron to the east the new road, although longer than the Strathconon route, would have been more easily traversed. The fate of the Strathconon road and the inn at Luib was sealed! – or was it?. In the course of time the Inn at Luibgargan became a sheep farm, replaced by an inn at Achnasheen. But it was not the end for the Strathconon road! NAS documents (Balfour Papers) GD 433/3/3/8 reveal that construction of a road from Luibgargan to Scardroy was proposed in 1807, surveyed in 1835 and resurveyed in 1844. From the evidence on the ground this construction was clearly carried out but no evidence of such could be found in the documents. By 1840 the Strathconon Estate had been sold to James Balfour of Whittingham who had made his fortune supplying the British Navy with provisions whilst in Indian waters; did he fund the construction of the road to give the population of his estate employment during a difficult time? 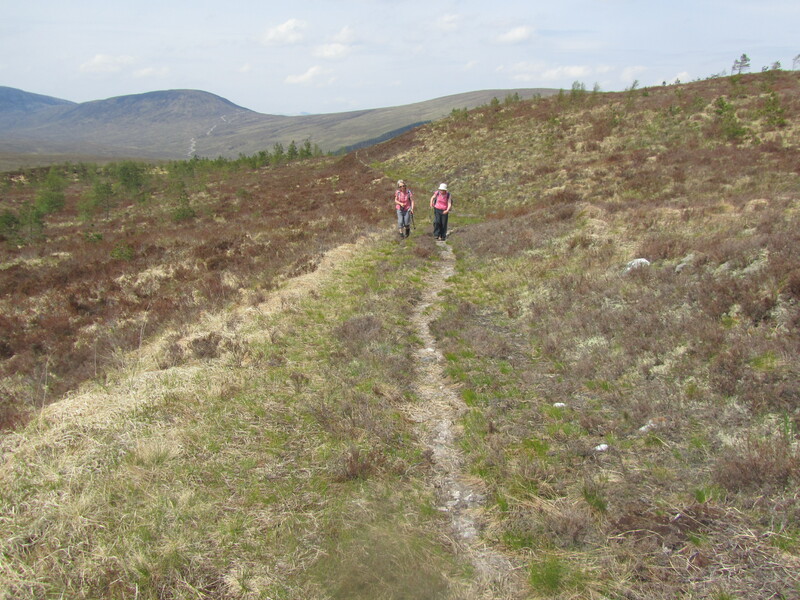 There are numerous examples of such projects being undertaken in the Highlands at this time. The road was not surfaced but this may have been by design, road builders were mindful that a hard surface was detrimental to the hooves of animals. In 1869 the Dingwall to Strome/Kyle of Lochalsh railway had been built. 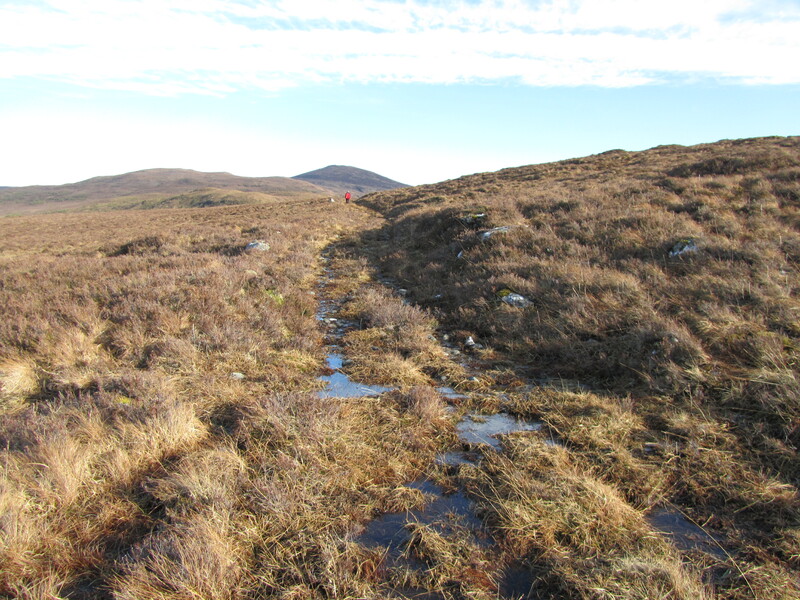 The road was possibly used by drovers taking cattle or sheep from the upper reaches of Strathconon to the station at Achnasheen for transport on the train to the Muir of Ord market. Whatever the purpose of the road, a walk along it makes a good day out.